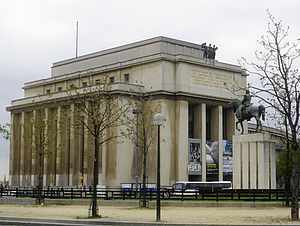 The Musee de l'Homme, the Museum of Mankind, is part of the extensive Musée National d'Histoire Naturelle, the National Museum of Natural History, and is located in the west wing of the Palais de Chaillot on the Place du Trocadéro. It was established here in 1937, when the Palais de Chaillot was built for the 1937 Exposition Universelle. It replaces the Museum of Ethnography which was housed in the Trocadéro Palace, on the same site as the Palais de Chaillot, since 1918. The Musee de l'Homme is one of the world's most important museums of anthropology, ethnology, paleontology and prehistory. It holds some of the most important French collections regarding these subjects and has more than one million objects in its inventory. The Exhibition space covers 10,000 square meters, 108,000 square feet, with a third of that devoted to the prehistoric and ethnographic collections. The remaining area is used for temporary exhibits and a library containing over 180,000 books. "Galleries of Ethnology" covering Africa, Asia the Americas, the Arctics and the Pacific Islands. There is also a "Room of Music", an impressive collection of musical instruments including a prehistoric lithophone from Vietnam composed of 10 stones cut in different lengths. The first collection to the museum came from the "Cabinet of Curiosities" belonging to French kings since the 16th century. This collection was previously part of the Museum of Ethnography. The museum is actively involved in every official French exploration expedition and is the recipient of their discoveries. Also among the museum's collection is the "Menton Man", a casting of the "Hottentot Venus", and the "Venus of Lespugue", which is a carving made from a mammoth's tusk, rock drawings from the Algerian Sahara and medieval frescoes from Abyssinia. The museum owns some 35,000 skulls and hundreds of complete skeletons. Also in this west wing of the Palais de Chaillot is the Musée de la Marine, the Maritime Museum. In the east wing is the City of Architecture and Heritage, Cite de l'Architecture et du Patrimoine. The Café de l'Homme is just next door to the Museum of Mankind, Musee de l'Homme. It serves lunch from 12:00-2:30 p.m. and dinner from 7:30-11:30 p.m. It is open from 2:30 p.m.-6:00 p.m. offering tea and coffee, pastries and other snacks. It gives an exceptional view of the Eiffel Tower. The Museum is closed for renovations until 2012.